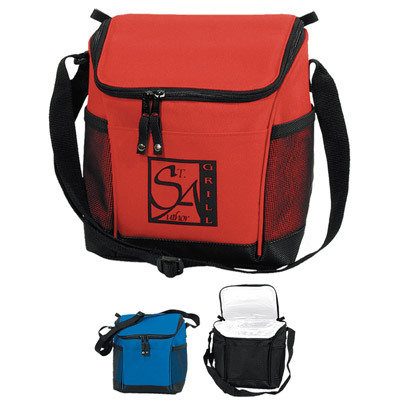 Personalized Designer Cooler Bags Custom Printed in Bulk or Blank. Made of Sturdy 600D Polyester. Promotional, Inexpensive. Budget Prices in the USA and Canada. Advertising Fancy Cooler Bags with 2 side mesh pockets. Lowest cost in North America. Free Art Design. American Clients pay no taxes.